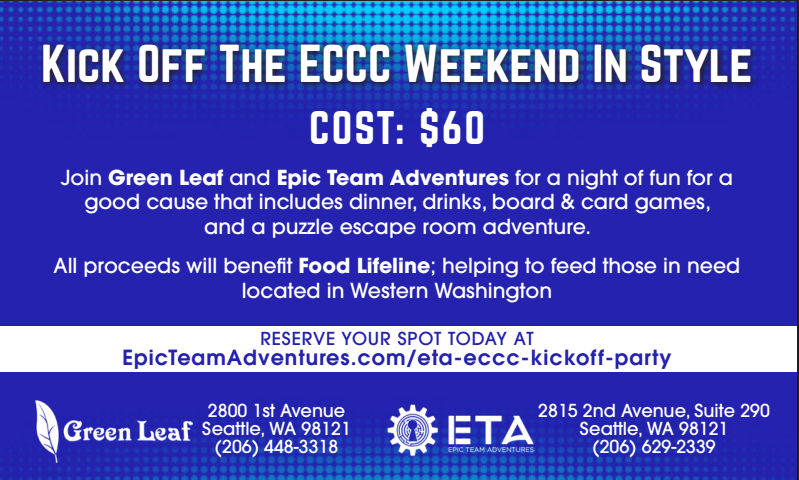 Thursday, March 2, 2017, from 5:00 pm to midnight, kick-off your ECCC weekend right by joining us at Green Leaf Vietnamese restaurant on 1st Avenue in Seattle for dinner, designer board games, and fun. Then, walk next door to Epic Team Adventures to be challenged by one of our six escape room adventures, with available start times spanning from 5:30 pm to 9:15 pm. Afterward, return to Green Leaf for board gaming and more good times! Net proceeds will benefit Food Lifeline – helping to feed hungry people in Western Washington. Ticket price of $60 + tax includes dinner, a drink, escape room admission, and random prize drawings. Dinner at Green Leaf will be a choice of appetizer (or salad) and entree from a special menu including house made fresh spring rolls, lemongrass chicken (beef, chicken, or tofu), pho, green papaya salad, and more. Also, you will have a choice of craft beer, wine, and specialty cocktails included with your ticket purchase. Additional drinks will be available for purchase, with $1 from the sale of each drink benefiting Food Lifeline. Ticket holders will have access to six different escape room adventures at Epic Team Adventures. Tickets and times are limited. Please choose your desired adventure and session time from our list of choices. Follow the links below for more details about each adventure and to book your escape room adventure. Your order confirmation email will serve as your admission to our private area of Green Leaf restaurant as well as to Epic Team Adventures. Valentine’s Day with Epic Team Adventures and Miller’s Guild Stay in the Loop!